Tamsin Arrowsmith-Brown exhibited at her first show in 2015, it was Ceramic Art York and she was still an apprentice. It was an impressive start to this potter’s career whose work was still very much in development. 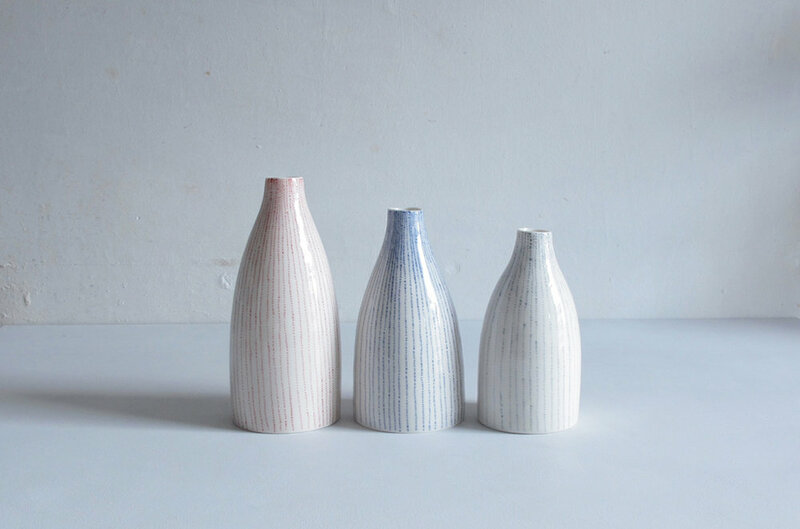 Tamsin’s ceramics have a very distinctive look; she makes small, wheel thrown porcelain objects in red and white, blue and white or dove grey with delicate patterns. In the 2 years since her first show Tamsin told Craft Editions that while the overall aesthetic has remained constant, her technique has developed considerably; it’s finer, lighter and more consistent. Tamsin came to ceramics late after studying Social Anthropology at Sussex University and having had a whole other career as a project manager, first in an architect’s practice and then in a graphic design agency. She comes from an artistic family though and there was always lots of making and drawing in the house; her mum is a painter and her sister is a potter. When she and her sister were young, Tamsin says they were always given a pencil and paper to amuse themselves - that or Playdoh. Although Tamsin loves drawing she had always been interested in pottery and was drawn to making physical objects. She finally found an adult education class that fitted in with her work hours and so she started to explore what had been an unfulfilled creative yearning. After first learning the basics of throwing on the wheel and hand forming, Tamsin attended the weekly evening class for 3 years, appreciating the valuable studio time. An unexpected opportunity arose when Helen Beard (whom Tamsin knew socially) found out about Tamsin’s interest in ceramics and suggested she use her studio at weekends whilst she was on maternity leave. This developed into Tamsin becoming her apprentice for a year, supported by Adopt-A-Potter. ‘I thought about it for about 5 seconds and realised it was exactly what I wanted. The idea of doing it every day was wonderful.’ Whilst she had enjoyed her job at the design agency and had some lovely clients, Tamsin said it was sometimes frustrating being in a role where she was only partly involved in the creative process. Also, she knew that ultimately she didn’t want to be a graphic designer. It was time to move on and do something genuinely creative herself. Tamsin uses her work to express her passions and interests. As soon as she began working with porcelain, she was keen to make bowls and cups that she could use at home. She loves to cook Asian food and so her signature pieces include soy sauce dishes, sake cups and rice bowls; small and elegantly functional. Her love of both Japanese and Nordic ceramics are evidenced in the neat, clean lines of her work as well as in its calm, blue and white colouring. The patterns that decorate Tamsin’s ceramics come from her other love, knitting and embroidery. She started off exploring the shapes of stocking stitch, running stitch and herringbone and it grew from there. She creates her delicate designs by drawing on the porcelain with an underglaze pen. The unique combination of form and decoration make Tamsin’s work instantly recognisable. After completing her apprenticeship, Tamsin continued to share a studio at Craft Central, first with Helen Beard and then with another maker. However, since Craft Central moved to the Isle of Dogs Tamsin has worked from a studio in North London which she shares with mother and daughter ceramicists Sally and Olivia McGill. She will be moving out soon though as she is in the process of building a studio in her new home, which she is understandably excited about. Tamsin is still enjoying developing the patterns that characterise her work but says she is exploring lots of different options at the moment. She may start to introduce more colour and she is also interested in working in bigger dimensions. She is also keen to start teaching ceramics so once her home studio is ready, Tamsin hopes to begin leading one-to-one classes there and share her love of making in porcelain with others. Find out more about Tamsin Arrowsmith-Brown here. Images by Craft Editions and courtesy of Tamsin Arrowsmith-Brown.